This past year, we officially announced the launch of our newest product offering, SageGlass Harmony™, the world’s most elegant dynamic glass, designed to provide daylight, heat and glare management while maintaining a seamless connection to the outdoors. Ryan Park, Global Head of Marketing and Product Management, shares his perspective on what makes this product unique and how it is transforming the dynamic glass market. Q: How is SageGlass Harmony different from your other two products, SageGlass® and SageGlass LightZone®? A: With the original product, we could tint the entire pane of glass to four different tint levels. At the clearest level, it let in 60 percent of light and at the fully tinted state, it blocked 99 percent of light, allowing for one percent light transmission. With LightZone, we can divide a single pane of glass into three distinct tint zones, and each zone can be controlled individually. For instance, if there is strong sun coming through from a high angle, but you still want to let in natural light, you can just tint the top section of the glass and leave the other two sections clear. SageGlass Harmony takes the best of both worlds – it can still block out the glare and let in as much light as possible. By using a gradient pattern, we have taken away the harder lines between the tint zones to create an indoor environment that is more appealing for occupants and more aesthetically pleasing for architects. Q: Can you tell me a bit more about Harmony’s tinting capabilities? A: Harmony can tint in a gradient pattern from top to bottom or bottom to top; or, the full pane of glass can be tinted at the various levels standard with every SageGlass product. Q: Where will Harmony’s first installation occur? A: Harmony will be installed in Millennium Center, a state-of-the-art office building in Switzerland – and the glass is already on its way! Q: Great! So, why was Harmony selected for this project? The owner wanted an incredibly high-tech, innovative center to attract the startup community. Moreover, he wanted to foster a creative environment that maximizes daylight from a health and well-being standpoint and enhances productivity. 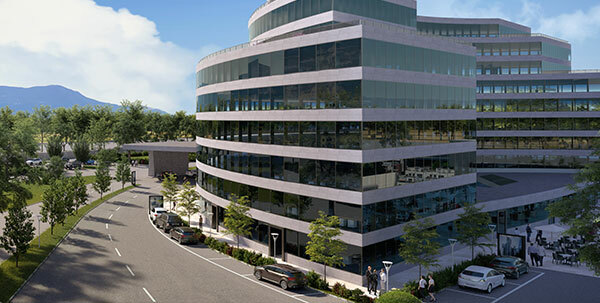 By installing SageGlass, the building allows natural daylight into all workstations as well as beautiful views of Lake Geneva and the mountainside. Glass was one of the most important elements of the project for the owner because he wanted to preserve that view across the lake. We also made things easy for the customer by ensuring Harmony could be integrated into the building management system to tie in with HVAC, lighting and security systems, to create a really nice occupant comfort and convenience solution. Typically, when people think about comfort they think about temperature. At Saint-Gobain SageGlass, we think not only about temperature, but also about glare reduction and the visual comfort element. Q: Along with enhancing the occupant experience, does this product have any sustainability benefits? A: We have found that dynamic glass helps reduce overall energy loads by an average of 20 percent and peak energy demand by up to 26 percent over a building’s life cycle. There are strong regulations around energy consumption in Switzerland, so Millennium chose Harmony to help reduce the amount of energy consumption by maximizing daylight while blocking out unwanted heat or glare, which helps reduce HVAC and the amount of artificial lighting used during the day. Switzerland often uses double-skin façades to achieve energy savings; however, these façades take up building square footage. Harmony removes the need for a double-skin façade and opens up the usable space. Additionally, Harmony, like other dynamic glass solutions, is more effective from a maintenance perspective! There is no need to maintain or replace any kind of blind mechanisms internally, or more complex external motorized blinds that come with costly repairs. Dynamic glass removes the need for other shading mechanisms all together. Ryan is responsible for overseeing SageGlass’ overall marketing strategy – from demand generation to product management. Ryan holds a B.S. in Electronic Engineering Technology from Minnesota State University Mankato and has extensive experience in marketing, strategy, product management and engineering.